Six more weeks of winter! That's actually a good thing if you live in the south. Have to enjoy these nice winter days before 5 straight months of 100 degree highs. 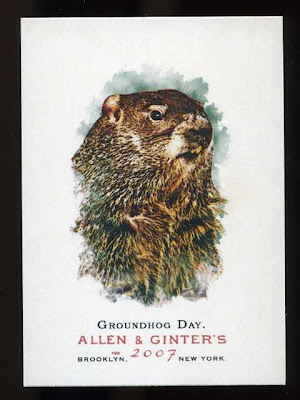 Today was the annual celebration of Groundhog Day, and it reminds me of this classic 2007 Allen & Ginter card. I love the quirky cards that Topps throws in that set each year. Happy Groundhog Day!